Young Roman nobleman Cato escapes Rome following a bitter political defeat. He hopes to begin a new life in Pompeii as a wine merchant, but he finds his new home steeped in corruption. His determination to remain apart from politics is shattered when the vile city leader sets his eyes on Cato’s married sister and intends to take her as his mistress. Cato vows to protect her, and when he discovers the identity of a fierce young girl masquerading as a boy gladiator, he longs to keep her safe as well. An injured man and an urgent errand bring Cato and Ariella to the home and meeting place of a group of Christians. At first both are reluctant to become involved with the strange faith, but neither can deny the genuine warmth and peace the group’s members possess and how deeply they hunger for such peace. Before either of them can understand the spiritual hunger or find a way to pursue it, a powerful volcano reigns terror on Pompeii and its citizens, and Cato and Ariella must overcome great obstacles to find one another and their families and escape the city. Higley has clearly done a monumental amount of research on Pompeii and her people, and many interesting cultural or historical tidbits are woven throughout the story, intermingled with fascinating characters and a beautiful landscape. For the most part, the plot is powerful and well-constructed, with only one weak spot: when Ariella has freedom within her grasp and she instead takes the place of a gladiator slave, it was hard to grasp why she would do this thing. The boy was not her brother, and surely if her deepest motivation was to find him, wouldn’t she have had a better chance to do so with her freedom? Despite this, City on Fire is a rich retelling of the story of a volcano and its wrath upon an ancient city, and a great pick for historical fiction fans. 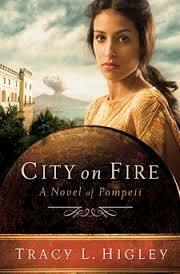 See Tracy Higley’s web site for more information on the research she used in her novel about Pompeii. References to aberrant sexual practices perpetrated by members of a cult who worship Bacchus. Descriptions are brief but creepy. Ariella was captured and enslaved in Jerusalem, and after experiencing cruelty and abuse at the hands of her perverse master, she abandoned any hope or faith in God. The wealthy Roman Cato has always gone through the motions of worship to the Roman gods. When the two cross paths with a secret Christian group, their hearts are drawn to the strange, kind ways of the people and the whispers of a Presence to which they can’t deny being drawn. As a slave, Ariella knew a cruel master. As a gladiator, she knows only violence as a means of survival. Details are brief, and she is usually spared from having to end the life of her opponent by the mercy of the games’ host. Some descriptions during the volcanic eruption are a little bit intense as well. During cult celebrations, participants drink wine laced with an opiate.